I understand that it is difficult to ignore hermit crabs in bad conditions. By buying them from pet stores you are are saving some from the bad conditions, however unless they stop selling hermit crabs altogether it is feeding the cycle. If you rescue hermit crabs from a pet store with bad conditions then you are supporting a pet store that is doing the wrong thing, and only encouraging them to buy more hermit crabs since there are no negatives about the way they care for their hermit crabs. The end result is that they are not motivated to change their practices Even if you could afford to rescue all the hermit crabs in the pet stores, the sad reality is that many crabs that are kept in poor conditions do not fully recover, even when kept in optimal conditions, some damage can not be undone. If after many attempts to calmly and courteously reach the employees and/or management of a store and it is clear that they are not interested in the welfare of the hermit crabs tell them that you are going to do a negative Crab Street Journal Pet Store Report and Yelp review on them and will be back in a week/month to see if they have made necessary changes. If no changes are made then I would rather boycott a store – make it clear that you (and your friends) will not buy products or animals from them until their needs have been met. I understand that for some they only have the one store and they need access to products but if you can switch stores to one that is meeting the care requirements then please do. Perhaps you could select products that you would have bought from them and put them on the counter and say, ‘this is the sale you just missed out on because you are unwilling to respond to feedback from what was a loyal customer’ and then walk out. That has worked for me in the past. They have called me back and were willing to make changes. If possible, fill out a Pet Store Report which lists the conditions you found in the store, What products are available for sale and how friendly, helpful and knowledgeable the staff are. Print it out. Write a letter addressing what changes need to be made and why they are considered to be stressful and detrimental to their health in the long term. Most pet stores don’t think of the long term effect a brightly painted shell may have on the life of the hermit crab. Ask for natural shells and recommend they view the Youtube video by Crabstreet on suitable hermit crab shells. Ask them what protein and calcium sources they have for hermit crabs. Ask them for some dried blood worms, baby shrimp, meal worms, spirulina, and other foods much loved by hermit crabs. If you don’t feel comfortable with face-to-face interaction then ask for the mobile cell phone number and email address for the manager or employee responsible for the hermit crab section. You can then communicate by email or text which allows you the time to research and word your questions, and then time for them to digest the questions and/or new information and to respond to it. It may help to include the essentials and checklists recommended for land hermit crabs and circle the total amount of the products showing how much money they stand to make if they set out their tank as outlined. Not only will it be a display of products available for sale but will entice people to buy more hermit crabs if they are happy and active. If you are comfortable with walking around the store with the manager and asking them where your favourite hermit crab products are, gently stating why some products may not be suitable, selecting items that you do want and then asking to see the hermit crab enclosure. You have products in your hands and the manager is seeing dollar signs. They are always more amenable when they know they are about to make a sale. Look at the substrate type. Your ideal substrate would be straight sand (not Calcium sand such as ZooMed Hermit Crab sand) or a combination of sand and Eco-Earth type coconut fibre. Explain why Calcium sand is not suitable if that is what they use. Ooh and Aah over the hermit crabs and comment on the temperature and humidity in the tank if it is below 70%/75oF or if there are no gauges to be seen. Assert that temperature and humidity levels must be monitored and to not have a gauge for them means that they don’t know when to adjust them. Add that they will sell more gauges if they are on display in the tank. 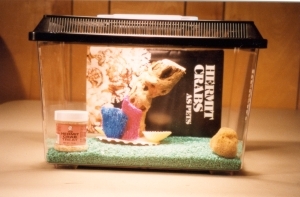 Customers use the crabitat set-up as a guide to setting up their crabitat. If the water dish is empty or low, ask them if they could refill it. If they only have the one water dish request that a second one be added so that they have access to both fresh and marine-grade salt water available. Look for places for the hermit crabs to hide and climb. If they don’t have any, suggest they use suitable stock from their shelves and point out that this is promotion of the items as suitable for hermit crabs. Ask what they feed the hermit crabs and refer again to the spirulina, blood worms, meal worms, baby shrimp and other foods available that your hermit crabs love. Ask them what water conditioner they recommend that removes both nitrates and ammonia. Sometimes asking these questions is a way of re-educating them if they didn’t know that they needed to be removed. Through asking for products that I would recommend for hermit crabs and commenting on unsuitable ones in a gentle manner, I find the manager then asks me questions and for advice on other hermit crab friendly products to be put in the hermit crab area. I often have a caresheets and business cards with me so they can contact me when changes have been made for me to look at. I ask them to give out the business cards when there are new hermit crab owners who have questions or if people want to adopt out their hermit crabs that are unwell. I take photos and promise to write a positive review on CSJ Pet Store Report and/or Yelp. I promise to return for more purchases because I support pet stores who care about the health and welfare of their land hermit crabs. I have used these strategies when visiting pet stores with less than adequate crabitats and care methods and the results have been remarkable. Once they see that they will make more money and attract more customers with a little work and maintenance on their part you may see a difference in the way they view hermit crabs and the welfare of land hermit crabs in their care. Once the manager is alerted to the problem things are more likely to change. Print out the Pet Store Report form, their most recent Pet Store Report for their store, the Yelp Review you did and ideally a Pet Store Report of a pet store that has been featured as Pet Store of the Month. As someone who has had many hermit crabs in her care due to the rescue mentality I realised that it is far better to educate rather than rescue. If you can’t educate, then it may be time to alert the authorities (Animal Control, PIJAC, PIAA, RSPCA, SPCA, etc) that deal with animal neglect or abuse in your area. I have been an owner of land hermit crabs for over twenty two years now. When I first started ‘crabbing’ I was a 22 year old at University and lived in a one bedroom apartment. When I first saw hermit crabs in the pet store I thought they would make a neat pet for me, and went home with ‘Mornay’ and ‘Fudge’ with a jar of crab chow, some wood shavings and a plastic water dish. I picked up a plastic tank on the way home, and used a desk lamp for lighting – just as the pet store had told me to. The combination of wood shavings and a desk lamp lead to my hermit crabs dying, and after some investigation I found I wasn’t alone. Millions of hermit crabs around the world have died in similar conditions simply because the people they trusted to impart information about the care of an animal had let them down. It wasn’t long before I decided to research land hermit crab care and realised that the pet store did not know how to keep land hermit crabs alive let alone happy and healthy. If they did, they would have taught me the temperature and humidity needs, and would never have sold me wood shavings as a substrate. Kritter Keeper – Not a suitable home for a hermit crab! Even less suitable than a plastic tank with a vented lid is the wire cage. Not only is there no way for the humidity to be retained in the tank with the crabs, the metal of the wire cage can cause problems with crabs climbing and breaking off leg tips, or causing injuries with claws and other body parts. In many stores throughout America land hermit crabs are displayed in wire cages because it gives the impression that the crabs are more active if they are up climbing and visible to the customer. Hermit Crabs love to climb, but a wire cage is not a suitable crabitat for long term care except in tropical areas with very high levels of humidity similar to that hermit crabs are found in the wild. Even in these areas, there are times during the year when the temperature level and humidity drops below optimal levels and a heating source is needed. I do not recommend adding an under tank heater to a wire cage, nor using lights which may dry out the crabs without the needed humidity that would be found in a glass tank with lid, under tank heater and a water source. 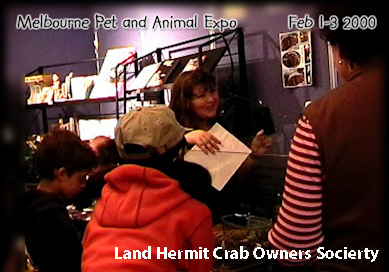 In many cases the pet store employees are not aware of what the end result of their misinformation may be, however there are many that do know what is needed and feel threatened that if people were informed of the products and expenses involved in keeping land hermit crabs happy and healthy they would be turned away from hermit crabs as cheap and disposable pet options. Needs such as a warm and humid environment, a balanced and varied diet, providing areas for them to de-stress, and other essentials such as temperature and humidity gauges would potentially see their ‘throw away pet’ sales would plummet. It is far easier to sell a $30 kit with a hermit crab in a plastic tank with some cheap substrate and food and water dishes – and rake in the money handed over by unsuspecting new crab owners. What is worse is when they continue to sell hermit crabs as tank mates die a slow death, become inactive in lower temperatures or leave their shells and shrivel up, in the low humidity environment. Unfortunately every pet store I contacted told me the same thing. That is what they were told by their supplier, and that is what they believe to be true. After all, as one store said, their hermit crabs didn’t die, so therefore what they were taught must be correct. Unfortunately they failed to realise that the hermit crabs they had in their store’s crabitat were quickly bought up by eager hermit crab owners and new hermit crabs ordered. Even in the worst of conditions hermit crabs can live for up to eighteen months, dying usually when they attempt to moult in conditions which are not suitable. In America the situation is similar, although the brands and products may change depending on what is cheap locally. Cheap substrates sold for reptiles such as gravel, corn cob bedding, newspaper, walnut shells and wood chips are used in many pet stores simply because it is cheap and available despite the fact that it is difficult to keep the correct temperature and humidity with this substrate, let alone its suitability as a burrowing medium. Calcium Sand is often used and sold, which when damp can cement a hermit crab inside its shell. It was developed for reptiles and clumps when wet. Forget Calcium Sand and use clean, washed high quality play sand that you can get in bulk from hardware stores such as Bunnings in Australia and Home Depot in the US. The vented lid of a plastic tank may be suitable in areas with high levels of humidity, but for most homes where the humidity level is below 70% they can cause inactivity, breathing problems and other complications. Many people buy these tanks because they seem cheap but when you compare their cost to a 20 Gallon glass tank with lid which can often be found in the US at $20 at yard sales, on craigs list and Gumtree (Australia), they really are not worth the money. Some hermit crab owners are able to keep the humidity contained within a plastic tank by covering the vented lid with saran (cling) wrap but glass is best. Even less suitable than a plastic tank with a vented lid is the wire cage. Not only is there no way for the humidity to be trapped in the tank with the crabs, the metal of the wire cage can cause problems with crabs climbing and breaking off leg tips, or causing injuries with claws and other body parts. In many stores throughout America land hermit crabs are displayed in wire cages because it gives the impression that the crabs are more active if they are up climbing and visible to the customer. Hermit Crabs love to climb, but a wire cage is not a suitable crabitat for long term care except in tropical areas with very high levels of humidity similar to that hermit crabs are found in the wild. Even in these areas, there are times during the year when the temperature level and humidity drops below optimal levels and a heating source is needed. I do not recommend adding an under tank heater to a wire cage (they melt! ), nor using lights which may dry out the crabs without the needed humidity that would be found in a glass tank with lid, under tank heater and a water source.